When it comes to safety, minivan owners toting a precious cargo of children and grandparents are always particularly interested in driving the safest models. Consumers now have to consider that it’s not only crash tests they should be worried about, it’s also the software packed in the van that helps it avoid crashes in the first place. An August evaluation of three popular family minivans by the Insurance Institute for Highway Safety gave Top Safety Pick designations to the 2018 versions of the Chrysler Pacifica and Honda Odyssey, while finding the Toyota Sienna just short of that rating. 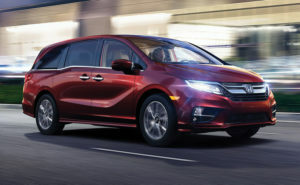 Honda’s Odyssey earned Good ratings in every crash test, as well as Superior ratings for its crash-avoidance systems and a Good+ for child seat connectors. The Pacifica didn’t rank as well in a passenger-side small overlap front crash test but scored Superior in crash-avoidance tech. Its child seat anchors got a Marginal rating, deemed to be too likely to disappear in the seat. Toyota, generally an industry leader in safety, got inspection dings for the afore-mentioned passenger-side small overlap crash test, scoring a Marginal rating. Still, it got a Superior rating for crash avoidance.